Fine grinding, also known as flat honing, is a new technology using fixed abrasive in lieu of loose abrasive for precision finishing. Depending upon the application, fine grinding technology utilizes fixed abrasive diamond or CBN (Cubic Boron Nitride) suspended in resin, metal, and vitrified bonds to grind a wide range of materials to very tight specifications. Fine grinding technology uses similar planetary machine designs and kinematics to traditional lapping technology, with several significant advantages. Fine grinding represents the next-generation precision finishing technology, offering several advantages over the traditional lapping process yet still yielding similar flatness, parallelism, surface finish, and size tolerances. The fine grinding process is much cleaner than lapping, virtually eliminating swarf disposal and work piece cleaning issues. This process is also typically 3-20 times faster than lapping, blurring the lines between traditional lapping and grinding technologies. The continuing development of fine grinding equipment and processes is bridging the gap between traditional flat lapping and grinding machines, utilizing the best technologies of both. Significant growth is expected in this technology throughout the metal, ceramics, and composites finishing industries where fine grinding offers increased productivity, reduced manufacturing costs, and a positive impact on the work environment. Effective component processing using fine grinding technology requires heavy-duty equipment with sophisticated control systems capable of high plate rotation speeds and down-pressure generation. 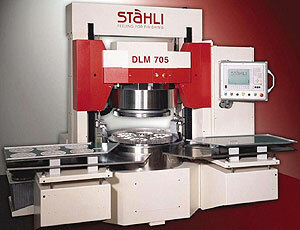 Fine grinding machines are available in both single sided and dual faced configurations. This line of equipment has been designed using the latest machine construction and control system technology, capable of executing complex grinding routines while producing precise and repeatable results. Typical applications include thin Parts, washers, stampings, gaskets, spacers, wafers, clutch disks, rings, seals, and thrust washers.